Out of stock: "Midgard Bestiary Pathfinder RPG Edition (Print)" doesn't have sufficient quantity in stock. Between the covers of the Midgard Bestiary: Pathfinder RPG Edition lurk more than 100 of the greatest monsters from Kobold Quarterly magazine and Open Designs award-winning adventures and sourcebooksalong with new threats youve never seen before. More than 50 new monsters and new art compared with the AGE edition of our Bestiary. That’s 50% new material overall. 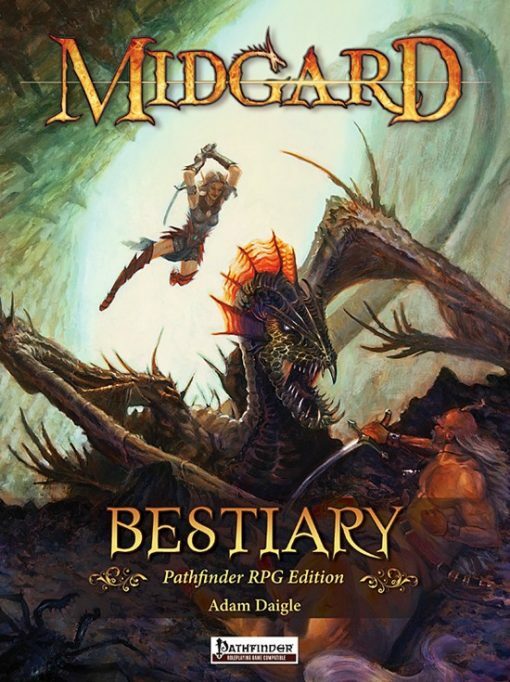 The Midgard Bestiary is a monster compilation with a difference. Born of Open Design’s organic development process, it draws upon monsters featured in Kobold Quarterly, the website and already-published materials as well as the traditional folklore that powers much of their output. Keynotes are that monsters ought to be scary and have the potential to be used in unorthodox ways to keep players guessing and on the edge of their seats. There’s an overtone of deep-rooted horror that permiates much of the Open Design (now Kobold Press) output, the sort of horror that stems from tales told and retold. Each of the 89 monsters gets the same treatment: brief ‘this is what you see’ description, a full stat-block, illustration and full descriptive and ecological notes that supply the GM with all the information he needs to locate and run that monster as an integral part of the campaign world, not just something to fight (although most of them will put up a good fight when it’s a brawl you are after!). Who could not delight in the bagiennik, an often peaceful creature with a talent for healing which goes absolutely mad with fury if you interrupt it when it’s taking one of its frequent and languorous baths… well, I don’t like being disturbed when bathing either! Even reading some of the entries can send shudders down your spine… like the broodkin, really nasty constructs that are a sort of malignant baby or the beautiful but deadly cavelight moss that delights in devouring passing adventurers. Twisted birds, a host of clockwork creatures, and the carrion-eating death butterfly swarm lie in wait, and the twisted evil of a derro fetal savant is just sick. I think I prefer the ink devil, these prefer chatting, whining, and pleading to any form of combat, being known cowards – and fun to role-play as well. Twisted, strange, unpredictable, the stuff of the sort of legends you tell around a camp fire late at night… just don’t get bitten by a doppelrat! 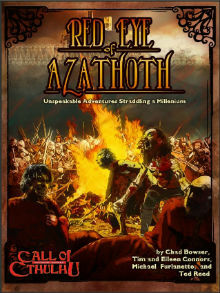 Whether your game is set in Midgard or in your own campaign world, when you want to scare the party as well as provide them with opposition, this is an excellent collection to browse through. To aid in selection, appendices list them by type, CR, terrain and role, while there are also notes on re-skinned monsters (ways to create quick variant critters) and a set of location-based encounter tables if you need a quick random monster. Definitely worth adding to your monster collection – you can never have too many!